Smart rings have actually been around for a while now (well, not that long, but things move fast in technology, so even 1 year is a long time). The first smart rings appeared in early 2013, but the concept and the rumours go back to the mid 00’s. Since then, each year has seen more smart rings reach the market, each one with more impressive craftsmanship and features. Sure, there have been many false starts. Kiskstarter is littered with great ideas for new smart rings that didn’t quite get to market. But the ratio of success:failure is improving. 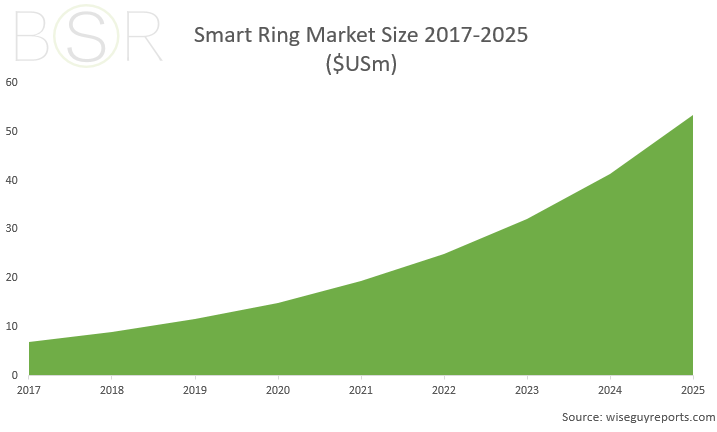 So just how big is the smart ring market size right now, and what growth is expected in the next decade? Will we see more and more rings arrive, increasing competition and driving innovation up and cost down? How big is the smart ring market? The global size of the smart ring in 2018 is $US9m and will reach $US55m by 2025 (Source). The main markets are United States, Europe, China, Japan, South Korea and Taiwan. Other smaller regions also contribute to the global market size. This growth represents around 29% CAGR (the compound annual growth rate) which is the rate at which the market will move annually, to reach that forecast of ~$US55m in 2025. To put this in context, the CAGR for device user growth in mobile phones for 2015-2020 is 13.1%. This entry was posted in Market News and tagged market share. Bookmark the permalink.